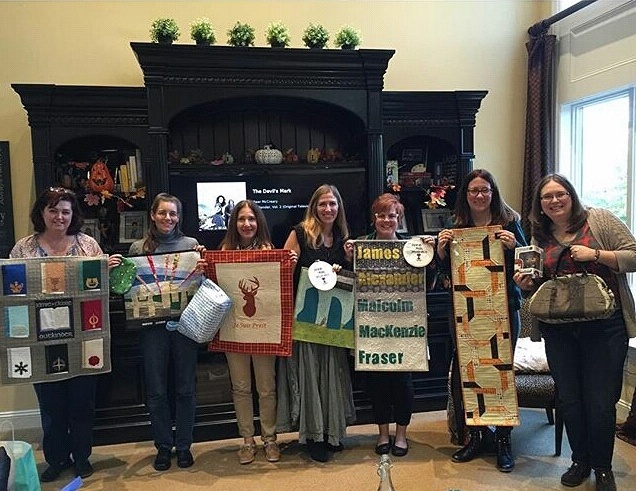 Within the Central Jersey Modern Quilt Guild, we have several Outlander fans. Nearly every time we have a sewcial (sewing day) or retreat, we discuss the books/show and/or watch the show while we sew. 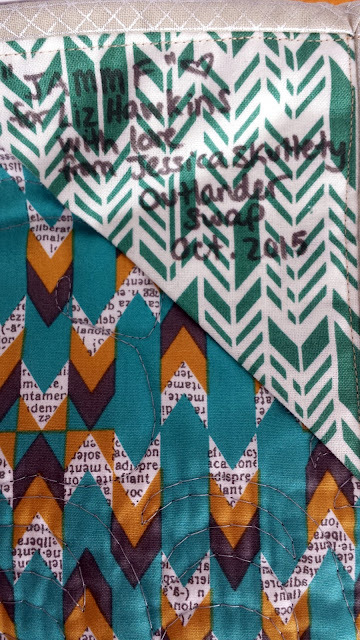 It only made sense that we start an Outlander swap! 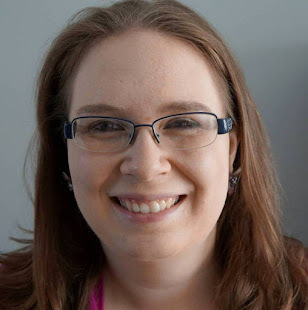 Jessica Levitt (@jtlevitt) organized the whole thing through email (let it be publicly known that I got her into the series in the first place!). We had 7 members total participating. For those who are unfamiliar, Outlander is an 8 book (so far), soon-to-be 2 TV season story, written by Diana Gabaldon. It's mainly a love story spanning 250 years, and it takes place chiefly in Scotland and American in the pre-revolutionary and American Revolution period. And yes, if you love to read, consider this your wake up call to try this extremely detailed and unique historical fiction series! Jess chose partners randomly, and it turned out that Liz Hawkins (@lizcr8s) and I got each other. Liz and I are very alike in our quilty tastes; we like scrappy and bold. Jess had provided a very detailed (and helpful) survey for us to fill out (including favorite characters and why, favorite quotes and symbols), but I was still stuck. 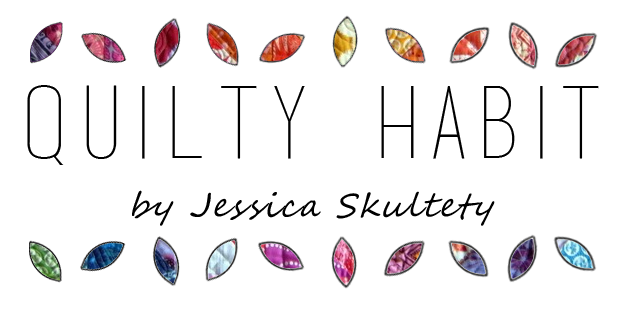 Finally, Jess helped me form an idea for a fun, fangirl-y wall-hanging, which features the full name of the beloved Jamie, one of the main characters in the series. I used Jess's raw edge applique technique, which involved printing the letters out, cutting them out individually, applying them to interfacing, and stitching them on with a small zig zag stitch. I'm really pleased with the method and would definitely do it again. The sharpness and accuracy of the letters is hard to beat. I had a lot of fun quilting the mini, too, as you can see. 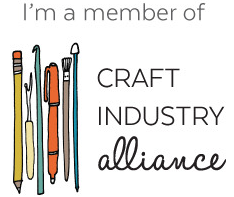 I chose FMQ techniques that would pop against the neutrals, and fabrics that were woodsy and Scotland related. And I'm happy to say that Liz loved it! 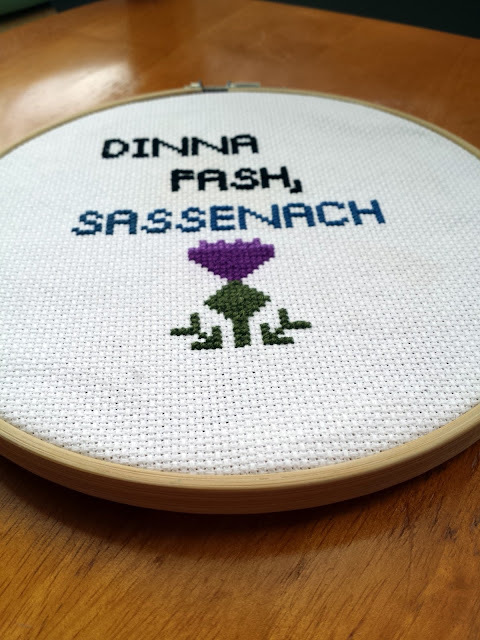 For the swap, we also had to make a small item, so I created an original cross-stitch design featuring Liz's favorite quote: "Dinna fash, Sassenach" (which is Jamie's way of telling his beloved Claire not to worry). Jess loves the quote too, so for our private Outlander swap, I made her an almost identical cross-stitch. I have dabbled in cross stitch and I really love the repetitive action. 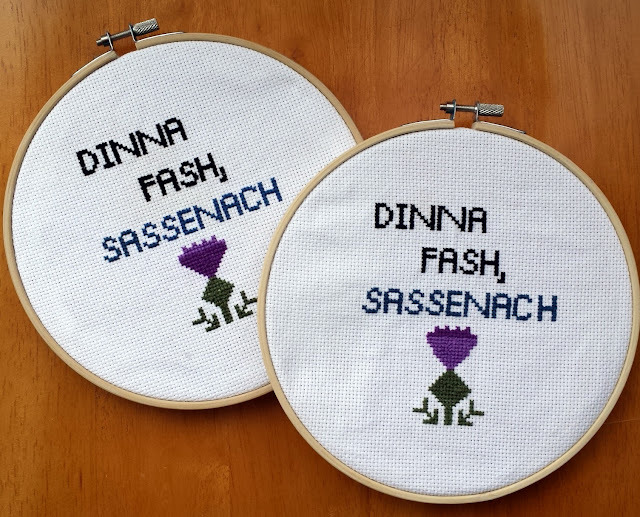 I was inspired by thistle cross-stitches on Pinterest to create my own. I see more cross stitches in my future. (Kind of) funny story: I spilled a huge amount of coffee on BOTH of these yesterday morning as I was finishing them up. Some quick action hand soap/rinsing/soaking had them looking good as new. Thank goodness, because each one took at least 6 hours to complete! Text: "Some Like It Scot." (LOL) "Outlander." 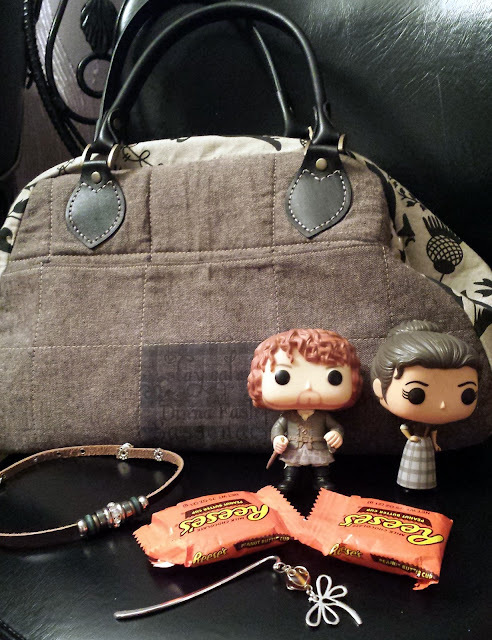 ...and included some awesome Outlander-y goodies AND a copy of her new book, Rewind!The POP figurines are already protecting my computer (by the way, the back fabric on the purse says: "Stay Calm and Dinna Fash, Sassenach"). Thank you, Liz!! I love it sooo much! I'll be sure to share what Jess made me soon (it's almost done!). Even if you've never heard of Outlander or experienced it (yet! ), hopefully you've enjoyed seeing my swappy makes. I've really had the MOST fun swapping in person with my guild and with other guilds. I'll likely only do swaps like these and private swaps with one or two people in the future - to limit how much I get involved and to get the most out of the ones I DO participate in! 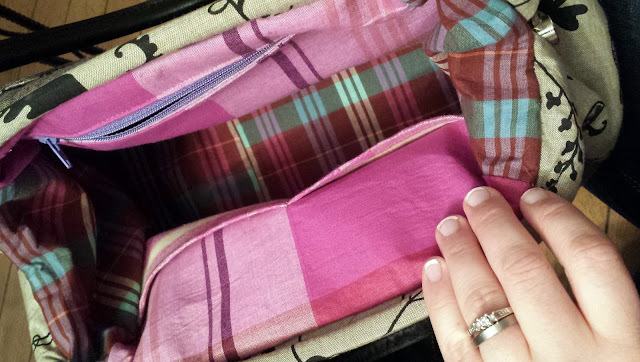 Linking up to Fabric Tuesday, Needle and Thread Thursday, Crazy Mom Quilts, TGIFF. What a fun swap, and how cool that you could all get together in person at the end! another art quilter first introduced me to Outlander! I have a question about the little corner label. Do you just write on it with a sharpie? lol. I am probably the last person on earth to know this question, lol. 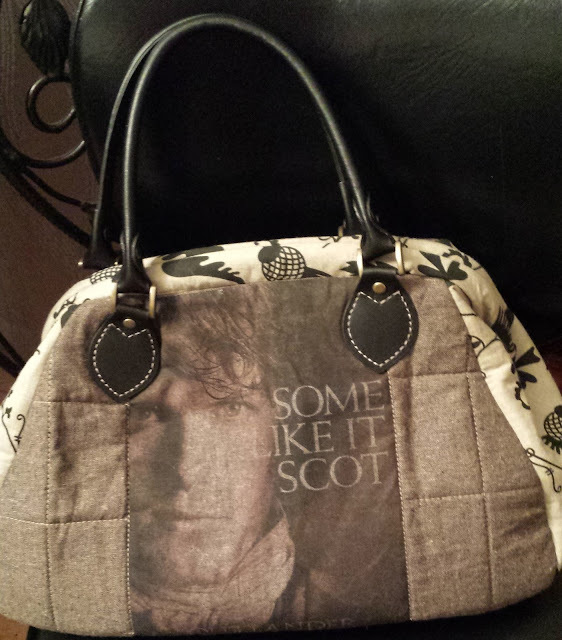 This is the coolest swap...I love your bag, you can look at Jamie all the time!!! 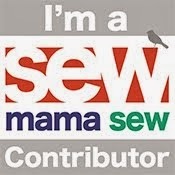 Your full name mini was a great idea, I love how it turned out with the FMQ. What a fun bag! Love all the details you and Liz included in your items--the details are what make the swap items so awesome! What a fantastic swap! And some fantastic projects. Thanks for sharing! Those are all so great. I have loved those books since she started writing them. So glad they made a tv show and it's good! Fantastic swap! Love it all, now I just may have to add those books to my to-read list. Tolle Idee ich liebe Diana Gabaldon ich habe alle Bücher gelesen und auch schon die ersten tv Filme gesehen . Leider sind sie nicht so ausführlich wie die Bücher .